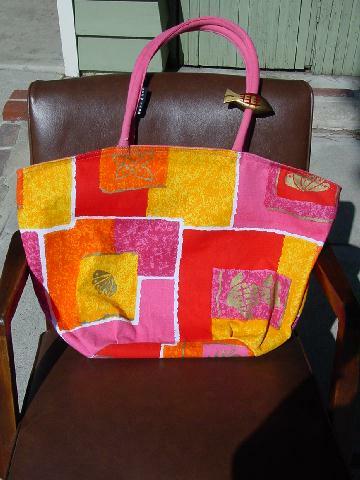 This colorful large tote is in dark pink, corn yellow, orange-red, white, orange, golden taupe, cranberry, and maize. 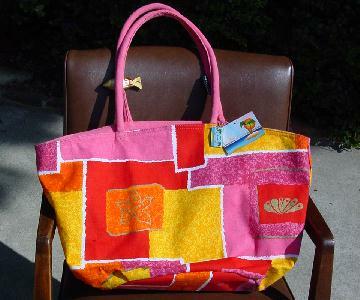 It has a washable lining with a pink fabric zipper compartment. There are two 26" padded fabric handles (with a gold-tone fish attached to one) and the top has a side to side zipper closure. The original manufacture tag (summer 2000) is still attached. It was used in a magazine photo shoot as background for a swimwear editorial.